Looking for some simple art projects to welcome in the changing fall colors? Try both of these! How about taking a walk to enjoy the fall colors and collect leaves? A nature, leaf and tree walk will yield plenty of hands on learning. Answering and asking questions. If you don’t know the answer to a question this allows you to give first hand knowledge of how to figure out the answer. Use problem solving skills once you are back in the classroom. Maybe it is a leaf or plant you can’t identify. Use your problem solving skills to find out what the item might be. 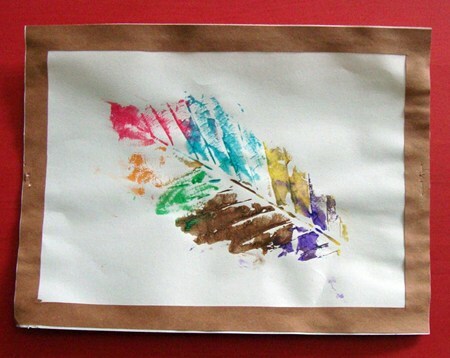 Paint leaves and press to paper to make beautiful works of art. Maybe the weather has not be cooperating to get outdoors and you would like to make these stained glass leaves. 1.) Cut out any leaf shape. 2.) Cut out the middle portion of the leaf, leaving a thick border. 3.) Glue a piece of wax paper to the backside. 4.) Glue scraps of tissue paper to the front side of the leaf in fall colors.